Website Protection. Expert Local Support. For small businesses, their website is a hard-working marketing asset. It works 24/7 to attract and inform your current and potential customers. Broken, incomplete or outdated websites reflect poorly on your business and can cause you to lose customers. A SiteWarranty keeps your site running smoothly, and provides affordable, knowledgeable support when your site needs some extra attention. Missing images? Broken links? Glitchy functionality? 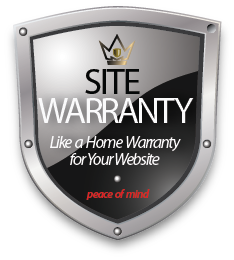 Your SiteWarranty covers it all! When a customer visits a website with broken links, misinformation, or worse, hacked code, they lose trust in your business. A small investment in a SiteWarranty, ensures that an expert is keeping an eye on your site, making necessary updates, backing things up and monitoring up-time. We keep your most important marketing asset, your website, working hard for you and constantly building trust with your customers.